Fire profoundly influences human health, the economy and wildlife. In Victoria, for instance, bushfires have burned more than one million hectares since 2009, claiming 178 lives and more than 2,300 homes, and causing more than A$4 billion in social, economic and environmental costs. And, as highlighted by recent devastating fires in the United States and South Africa, effectively managing fire risk is a global challenge. To reduce fire risk, the 2009 Victorian Bushfires Royal Commission recommended that the Victorian Government aim to burn at least 5% of public land as an annual rolling target. The Inspector-General for Emergency Management is currently reviewing this simple percentage target against a new risk-based approach to bushfire management. Is a state-wide percentage target the best way to reduce risk to human life and property and maintain our globally significant biodiversity? We think not. Across the world, planned burning is the main tool for reducing bushfire risk. It is effective when used in key locations by reducing fuel loads, which in turn reduces fire spread rate and intensity. Appropriate planned burning can also manipulate native vegetation to benefit certain plant and animal species. But burning 5% of public land each year (390,000 hectares in Victoria’s case) has three main limitations. Many native plants and animals rely on fire to regenerate habitat and maintain populations, but too much fire can be bad. 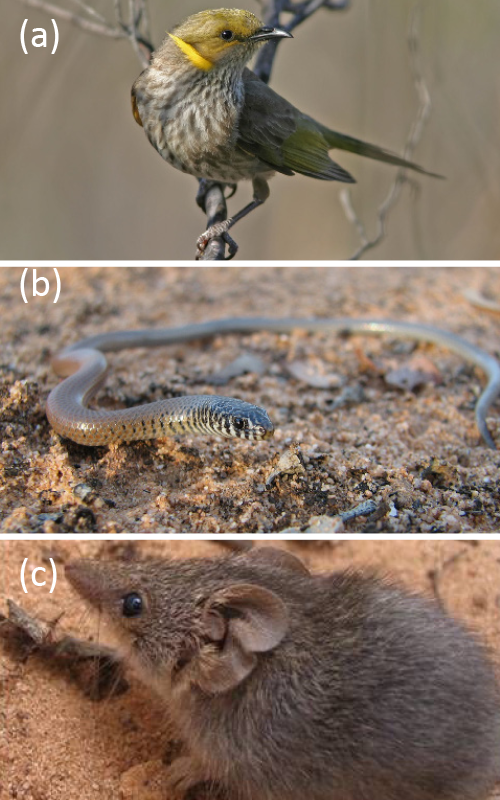 Consider the three animals pictured in Figure 1. Our new research, published in the journal Ecological Applications, shows that burning 5% of public land each year will harm biodiversity in the mallee shrublands and woodlands of north-western Victoria (Giljohann et al, 2015). 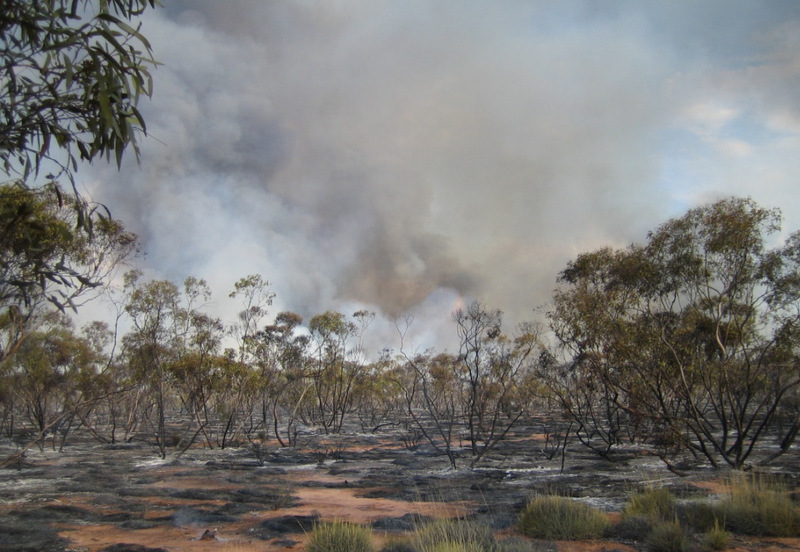 We used stochastic dynamic programming to model how fire changes vegetation in the presence of both planned burning and bushfires, using an extensive data set of birds, small mammals and reptiles. We found that burning 5% of a given area increases the risk of extinction of a range of native species. This is because, while some species prefer more recently burnt vegetation, most fire-sensitive species occur in older vegetation, which is largely eliminated when burning 5% each year. To date, this is the only peer-reviewed paper that predicts how Victoria’s current burning strategy influences wildlife diversity. 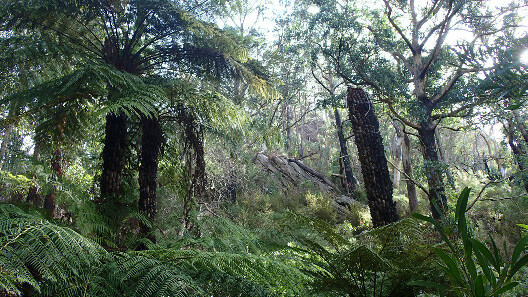 Ecosystems across Victoria are not uniform. They contain different plants and animals, they have different fire regimes, they have different fuel loads, and they present different fire risks to humans. A simple, state-wide target covering such a large and diverse area inevitably misses these important details. Put simply, what might be an appropriate fire regime for one ecosystem (such as a forest or woodland) is very different to an appropriate fire regime for another (such as a grassland or heathland). The current percentage-based strategy does not focus enough on the most at-risk Victorian communities. Large-scale planned burning in remote areas, such as the Murray Mallee region, makes it easier to achieve the state-wide planned burning target. But it is an inefficient use of resources, and does little to reduce the risk of major bushfires to human life and property. 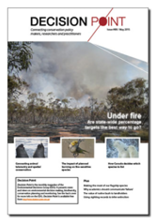 Research completed after the 2009 Black Saturday fires showed that the most effective way to protect houses is through burning (or clearing) vegetation in close proximity to properties (Gibbons et al, 2012; and see Decision Point #56, p6-8). A state-wide target, in contrast, encourages burning in remote locations where the benefits can be negligible and fire-management resources wasted. Figure 1: Frequent planned burns will impact on many native species. Consider: (a) The yellow-plumed honeyeater is one of many birds in mallee shrublands and woodlands that prefer older vegetation with large trees. (Photo by Rohan Clarke/Wildlife Images) (b) The southern legless lizard and (c) Mallee Ningaui inhabit areas with a high cover of hummock grass that take decades to develop after fire. The Victorian Bushfires Royal Commission also recommended that the Victorian Government develop risk-based performance measures for bushfire management. In response, the Department of Environment, Land, Water and Planning has developed sophisticated methods for mapping risks from major bushfires across the state, and predicting bushfire risk following planned burning. We strongly support this more sophisticated, regional risk-management approach. After all, planned burning to protect human life and property should naturally focus on places where people are at most risk from major bushfires. But what about also considering wildlife? Recent research we have undertaken offers a way to predict how planned burning influences risks to biodiversity (Kelly et al, 2015). We developed a method for determining the optimal fire history of a given area for biodiversity conservation by linking tools from three fields of research: species distribution modelling, composite indices of biodiversity, and decision science. By clearly defining fire management objectives based on the habitat requirements of fire-sensitive species in a community, this approach could be used to maximize biodiversity in fire-prone regions and nature reserves. This will allow land managers to consider the trade-off between protecting people and conserving wildlife when applying planned burning. Just as the 5% target is an inefficient method for minimising the impact of major bushfires on human life and communities, it also has negative consequences for the resilience of natural ecosystems. To be clear, we are not advocating a blanket approach of less (or more) planned burning. We are saying that a mix of strategic and broad-scale planned burning should be done so as to make the biggest reduction in risks to people and wildlife. That is not best achieved by a state-wide target. It’s time to drop the simple 5% target. It is a blunt tool, and a risk-based approach more effectively focuses fire protection where it’s most needed: safeguarding people and wildlife. Giljohann KM, MA McCarthy, LT Kelly & TJ Regan (2015). Choice of biodiversity index drives optimal fire management decisions. Ecological Applications 25, 264–277. Kelly LT, AF Bennett, MF Clarke & MA McCarthy (2015). Optimal fire histories for biodiversity conservation. Conservation Biology 29, 473–481. An interesting article and although there is no doubt % targets are blunt tools there are a few issues worth considering. On a local scale it is possible depending on what you define as the preferred biodiversity of an area (do all species have to occur across the entire spread of their habitat for conservation of biodiversity to be effective). The comments below address this somewhat more. The premise of the article is almost that everyone who works in this area is not smart enough to come up with something a bit more refined once they are given a broad target. Within a well formulated prescribed burning program there are many objectives. Some regimes closer to higher density population areas will result in the localised loss of species that require a long fire return interval; that is a political choice that places higher priority on human life and property than biodiversity. Other prescriptions for burning will have a focus on biodiversity and be designed to enhance the chance of maintaining species. Admittedly these are often based around one or two focal species. A bigger question for those developing fire regimes for biodiversity is how you get beyond the focal species issue and the work done by Kelly et al. is a good example (noting that a lot of data was available for that study which is a luxury not available everywhere). One of the papers (Gibbons et al. 2012) you rely on misses the point of prescribed burning at a distance from houses. Prescribed burns kilometers from the nearest homes are designed to either prevent the fire from properly initiating or make control easier so that the fire never reaches the area close to homes. Using an area that has a very low percentage of the landscape burnt (Victoria) makes it impossible to factor either effect in. Your assumption that it is inefficient requires further investigation as more remote burns are less costly (on average) than those very close to urban settings but many times allowed control at a reasonable cost. This is in contrast to situations where the more remote fires become large scale fires that finally reach a stage where massive resources are required to control the impact on high value assets (or not being able to control it as the case may be on extreme fire weather days). Another factor affecting efficiency that is poorly explored on a landscape scale is how the intensity of the fire changes the biodiversity response. Would you be better off sacrificing most of the area in a prescribed fire regime that disadvantaged species that require a long fire interval return time so that you significantly reduced the risk of very high intensity, large scale fires? Would the likelihood of retaining the fire sensitive species on a landscape scale be improved or disadvantaged by either scenario? It may even be that species that are robust in terms of their response to frequent fire are significantly disadvantaged on a local scale by large fires that are very intense. Thanks for provoking some more thought.